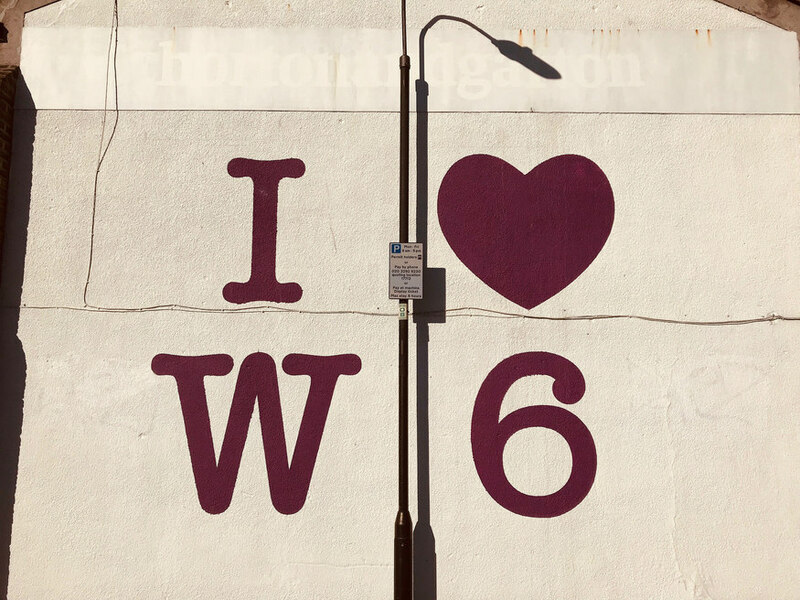 Our series on London etymology continues with a look at the stations of the District line. Find out how your local station got its name. See also Bakerloo, Central, Hammersmith & City, Jubilee, Metropolitan, Northern, Piccadilly and Victoria lines. 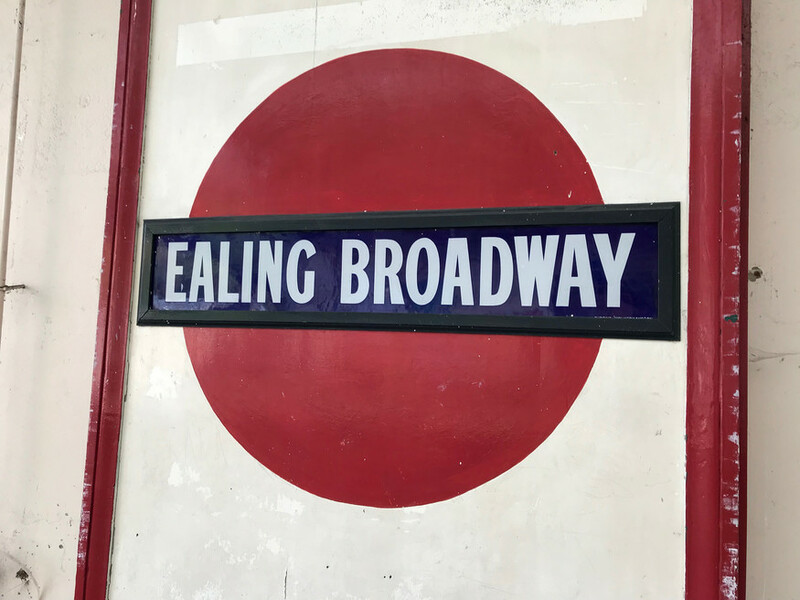 One of the oldest names in the London region, Ealing is attested from around 700 CE. There once, it seems, was a local chieftain known as Gilla, whose people were the Gillingas. This slowly transmuted into Ylling then Ealing. 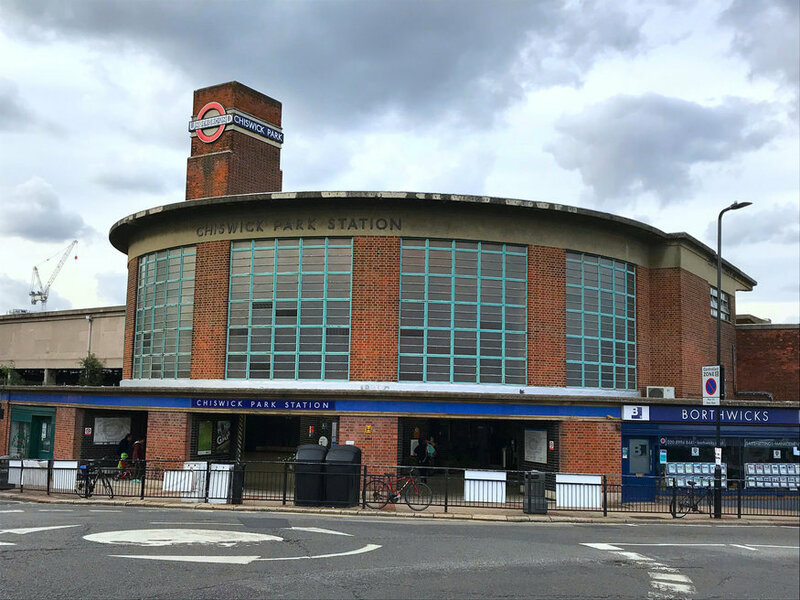 The long-lost chieftain would be proud to know that his name now decorates two District line stations, two further Piccadilly line stations and two mainline stations — even though the big man could never have conceived of the railways. The transport map is as replete with Actons as it is with Ealings. This time, the name comes from a natural feature — an Old English phrase meaning an enclosure surrounded by oaks. Acorns have the same root, in more ways than one. Chiswick has one of the most delightful etymologies in London. It harks back to Anglo-Saxon times when a cheese farm must have stood close to the banks of the Thames. Chiswick is literally the settlement of cheese. The suffix '-bury' usually tells us that a manor house once stood here. In this case, it is the manor of Gunnhildr, a Scandinavian name. Whether it was home to Gunhilda, the daughter of 11th century celebs Emma of Normandy and Canute, remains speculative. Diving across the Thames, we reach a station named after the popular horticultural attraction. 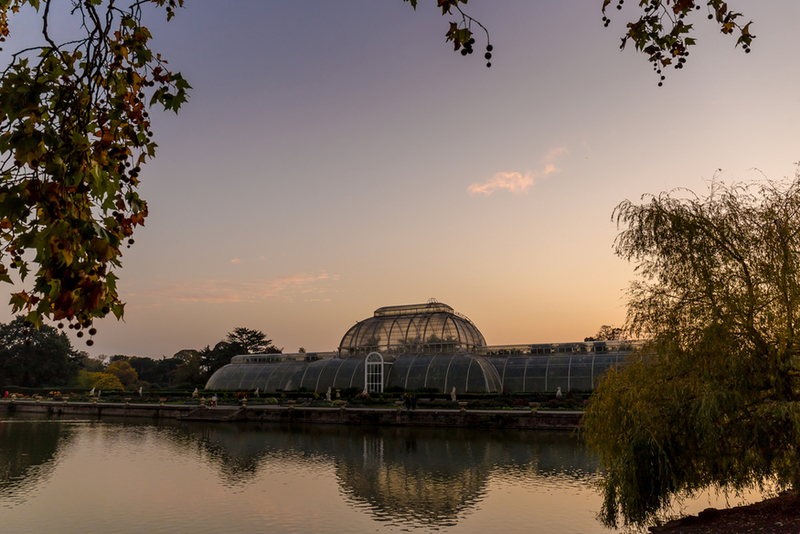 Kew is a most peculiar word. It comes from the same Old French root as quay, and as such denotes a landing place on the Thames. Its earliest occurrence, in 1327, is Cayho — the 'ho' part indicating a spur of land. It's fun to imagine the process by which Cayho gradually came to be pronounced 'Kew'. A relatively recent coinage (well, around 1500), the borough, town and park took their names from the now-vanished Richmond Palace, built on the river by Henry VII. His former title was Earl of Richmond, relating to the town in Yorkshire. That place's name comes from Old French for 'strong hill', which might equally apply in this gradient-fond part of London. The pun-maker's favourite tube station bears a hidden reference to the River Thames. The '-ham' derives from the Old English word hamm, meaning a watery, meadowy kind of place. That's because the hamlet stood close to the (then much-wider) Thames. The river is very twisty hereabouts, and the 'Turn-' prefix supposedly reflects that ('turn' being an Anglo-Saxon word meaning circular). London's only river whose name sounds like a US politician (although we think Tyburn Gallows might have made a good Republican senator). This lost stream separated Hammersmith and Chiswick, and gave its name to the area and Underground station. It's said to derive from Stoney Ford, which doesn't sound at all gubernatorial. This name is relatively modern. It was chosen in the mid-18th century by a fellow called Thomas Corbett, who had recently purchased the manor house. The Corbett family, it seems, liked to indulge in wordplay. Their coat-of-arms included a raven, the French word for which is 'corbeau'. Thomas Corbett named his new gaff Ravenscourt, inspired by his personal rebus. 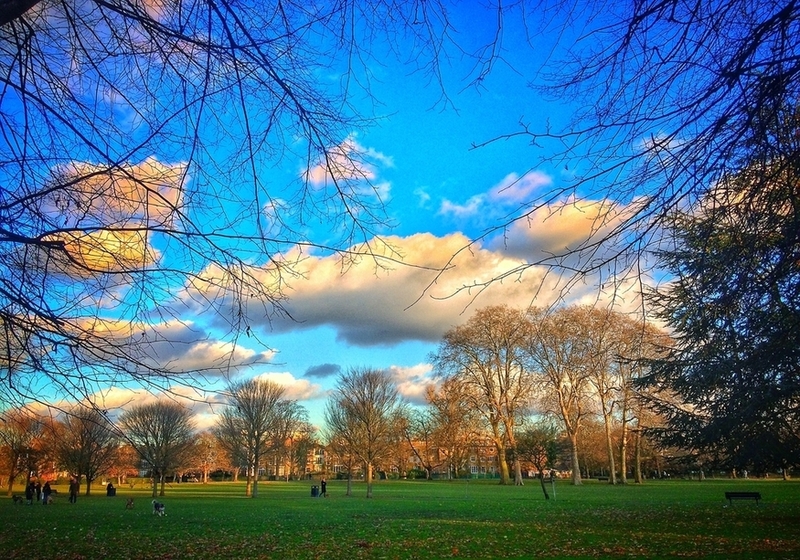 The 'Park' bit was appended in the early 19th century when housing was built in the grounds, and reinforced later that century when the open space became a public park. Alas, nobody is quite sure as to the origins of this place name, first recorded in 1294. Some sources suggest it derives from Hammoder's Hythe (a safe haven belonging to Hammoder); others, perhaps more satisfyingly, strike a concatenation of 'hammer' and 'smithy'. Hammersmith may have been an area important for metal working. Can we rename it Thor's Town? A name invented at the end of the 19th century to encompass new housing developments. It (probably) has no historical association, and was chosen as a pairing with nearby Earl's Court (much as Queensbury nodded to Kingsbury). These two stations get their names from another forgotten Saxon chappie. This time, Mr Cynesige or Kenesigne, no known relation to the fellows who gave us Kenton and Kennington. The Kensington part is another echo of Mr Cynesige. Olympia, meanwhile, refers to the exhibition centre established here in 1886 — presumably given that grand title in homage to the Olympic city of Ancient Greece. 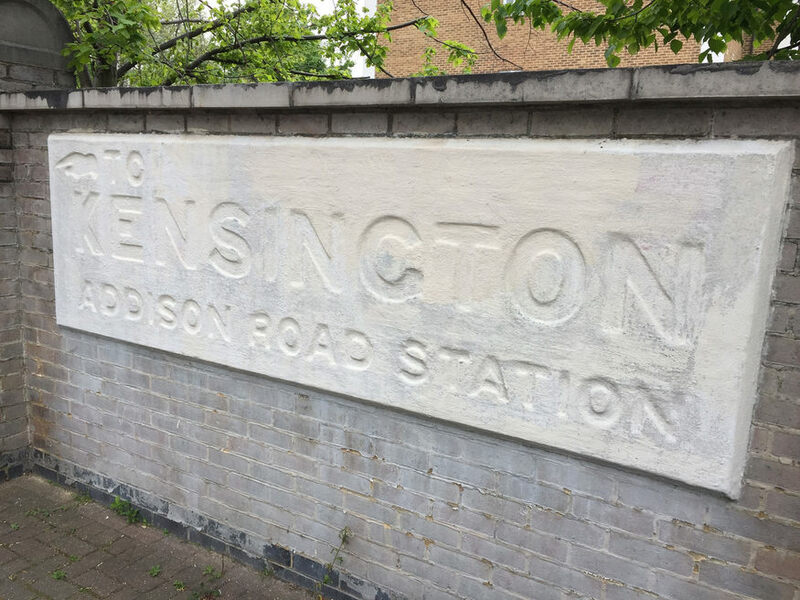 The station was known as Kensington Addison Road until a name change in 1946. A bit of a mystery on Hugh Grant's doorstep. Notting Hill is recorded from the 14th century under various knutting, nutting and knotting guises. The most likely origin is from a personal name such as Cnotta, with the 'ing' bit meaning 'people of', as with Ealing. Or, to paraphrase Michael Caine (who filmed part of the Italian Job here), "Cnotta's lot of people know that". Bayswater might look pretty landlocked today, but the district stands close to one of London's lost rivers. The Westbourne still flows through the area, but is now relegated to a sewer. The Bays part is thought to come from the Bayard family, who owned land here in the 14th century. The name was recorded as Bayard's Watering in 1380. 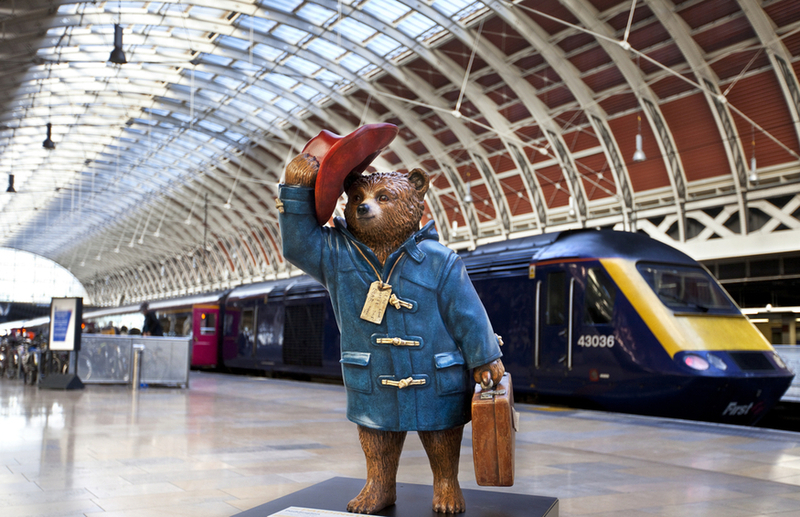 The west-facing station, the wider area, and a certain bear all carry a name that, yet again, comes to us from Anglo-Saxon times. It probably refers to a local land-owner called Padda (the exact name is uncertain), with 'ton' or 'tun' meaning 'the village of'. The old Roman route of Watling Street takes many names along its course. Where it twists north at Marble Arch, it likes to be called Edgware Road (because, after miles of light industry and noisy slipways it does eventually reach Edgware). That name recalls an otherwise forgotten Anglo-Saxon chieftain called Ecgi, associated with a fishing pool (weir or ware) in these parts. A broom plant we found growing on Wikipedia. Image by MPF under creative commons licence. Brompton Road, West Brompton and the diverse other Bromptons round here all owe their name to a humble plant. The common broom (Cytisus scoparius) is a widespread shrub with golden yellow flowers. It must have been particularly busy in these parts, for it came to define and eventually name the nearby settlement. We'll meet this shrub once again on the District line when we reach the East End. The name of Fulham is about as Anglo-Saxon as it gets. 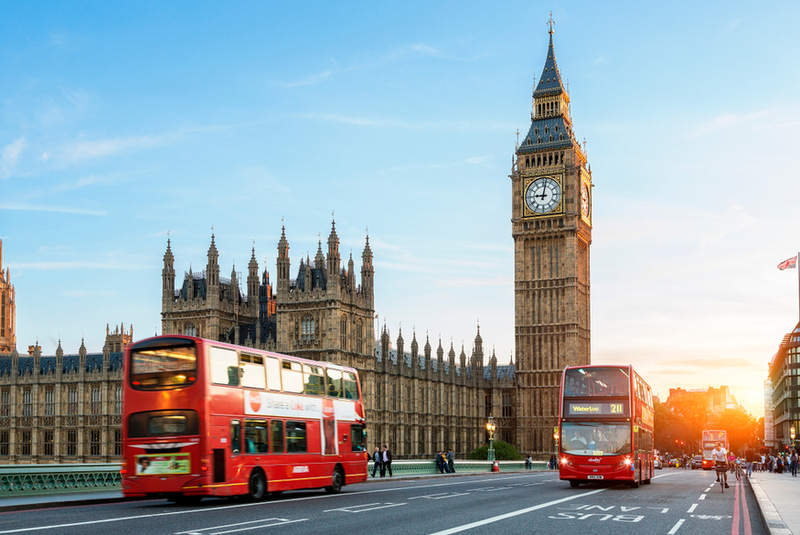 It is first recorded as Fulanham in a text from 691, making it one of London's oldest place names. It almost certainly derives from the personal name of a fella' named Fulla, who dwelt beside a watery meadow (-hamm). 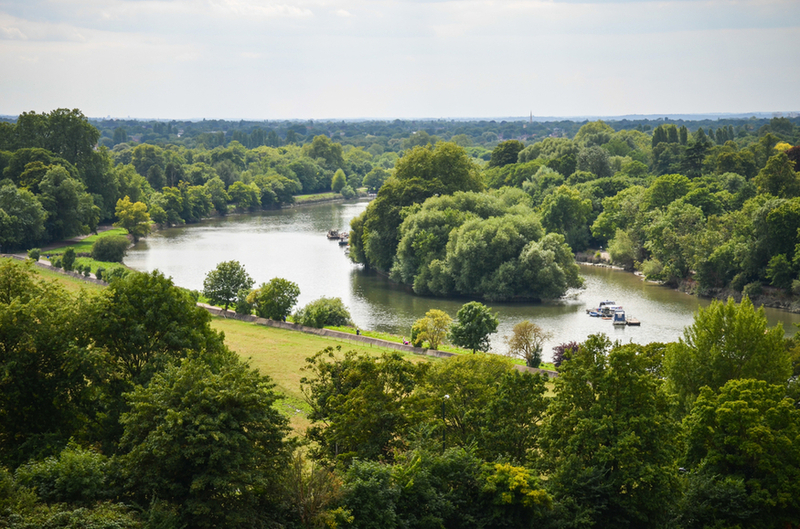 Fulham proper was historically located on the river beside Fulham Palace. 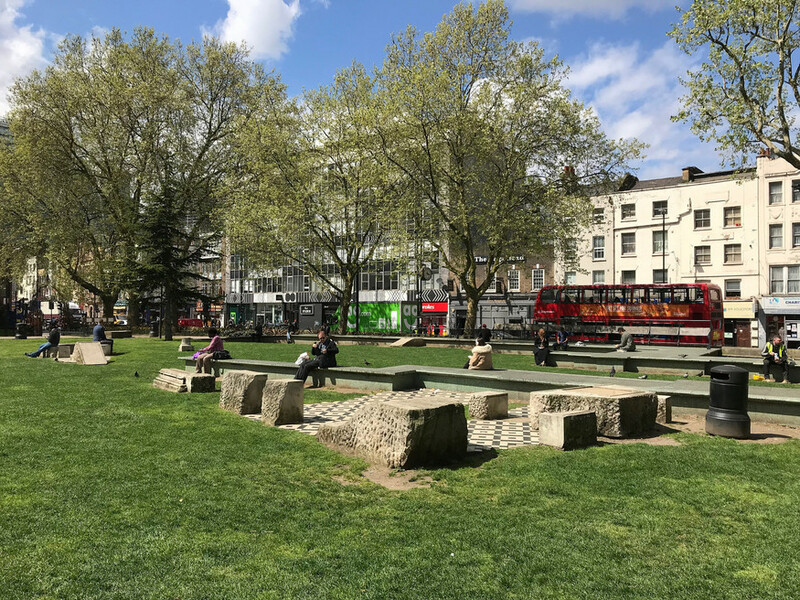 The area around the station was originally known as Walham Green (first recorded in the 14th century as Wandongrene), and the station carried that name until the 1950s. This name is exactly as it sounds. Here, beside the still-extant village green, was located Fulham's parsonage from medieval times. Putney is another place name from Anglo Saxon days. This riverside settlement grew up around the landing place of a Saxon called Putten. These were once the fields south of Putney, first named as such in the mid-13th century. They remained open land right up to the dawn of the 20th century, after which the fields were filled with modest, yet now unaffordable, housing. The suffix 'don' usually denotes a hill. Wimbledon occupies quite a large one. The name is first recorded as Wunemannedunne in 950 CE, indicating a hill owned by a guy called Winebeald, or something similar. Earl's Court has noble origins dating back to the Norman Conquest. The land was held for more than 500 years by the Vere family, Earls of Oxford. Their manorial court was located very close to the where the underground station stands today. The name is linked to Maria, Duchess of Gloucester and Edinburgh, who built a house on the street (at the time called Hog Moore Lane) in 1805. One of three stations on the line to be named after women (see also Gunnersbury and Victoria). South Kensington is roughly south of Kensington, whose derivation we explored above. He helped to establish the British Museum, and sort-of invented hot chocolate. Quite right, then, that Hans Sloane (1660-1753) should be honoured with an Underground station. The long-lived gent owned the Manor of Chelsea from 1712, and his name pops up all over the place. 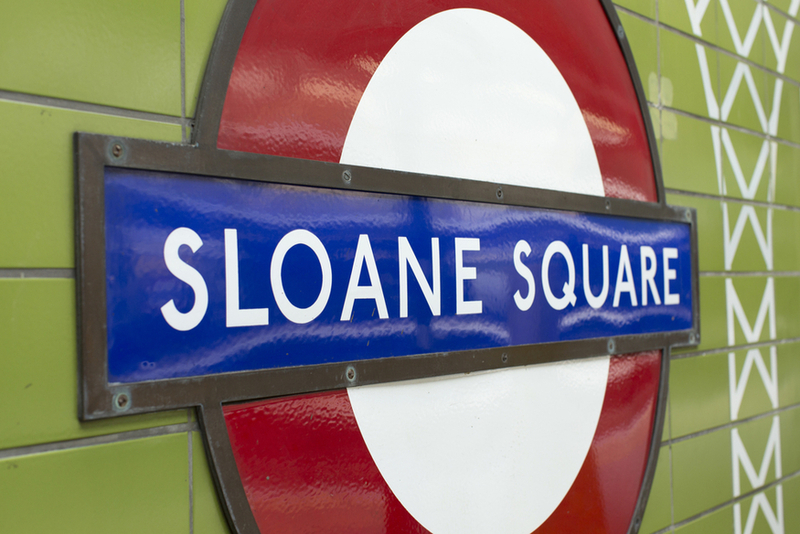 A 'Sloane Ranger' or Sloane was once a popular term for an upper-middle-class fashionista — the type who might frequent this posh neighbourhood — though we've not heard anyone use it for about a decade. Named after Victoria mainline station, which was in turn named after Victoria Street which, like so many things in London, honours a certain queen. Had you attempted to catch the tube here at the start of Victoria's reign, you would have got very wet. Victoria station was built on the site of an old basin serving the Grosvenor Canal, remnants of which still exist on the Chelsea river front. The station, somewhat predictably, takes its name from the adjacent St James's Park, which itself is named after the nearby St James's Palace. Why was this 500-year-old palace so dedicated? It was built on the site of a medieval leper hospital in memory of St James the Less. Why did the hospital choose that saint? The answer is lost in the mists of time. Previously called Charing Cross, then Charing Cross (Embankment), then Charing Cross Embankment, this station finally settled on its current name of Embankment in 1976. Its origins are fairly obvious. This was one of the stations built within Joseph Bazalgette's Victoria Embankment in the 1860s. The Inner and Middle Temples stand nearby. These are not holy places of worship, but enclaves of the legal profession. The lawyers moved in during the 14th century, on the land formerly owned by the Knights Templar — hence the name. 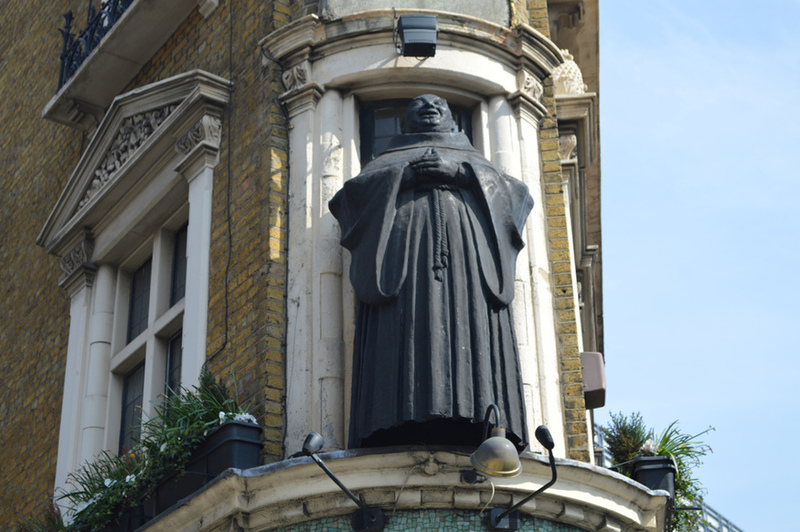 One glance at the area's most characterful pub, opposite the station, will show you where this name came from. The Dominican monks who — like so many Londoners since — favoured black garb, once held a priory here. Named after the Lord Mayor's official residence, which stands nearby. But not that nearby. 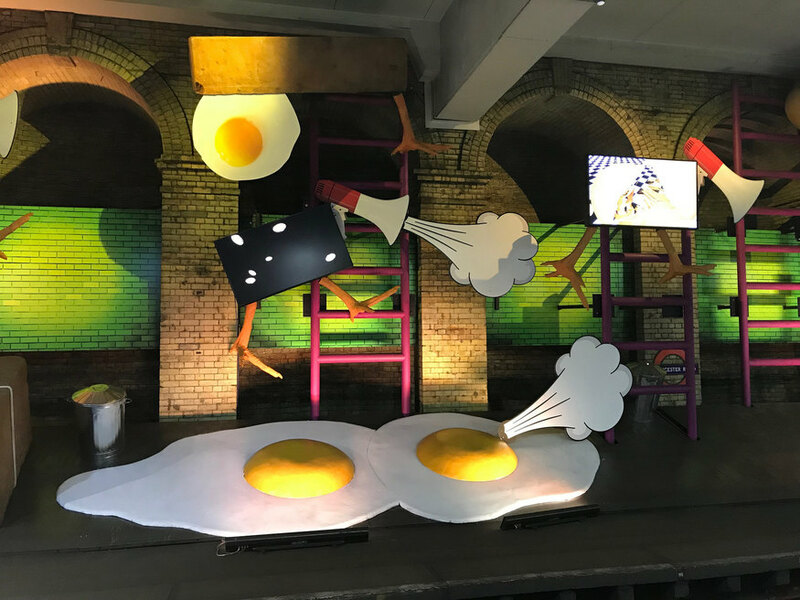 One of our favourite London facts: Mansion House station is the third closest station to Mansion House (Bank and Cannon Street are closer). Counter-intuitively, this station and the street it inhabits have nothing to do with either religious canons or fighty cannons. Cannon Street is, rather, a 17th century shortening of Candelwrichstrete — the street of candle makers, as first noted in 1190. The origins are still hinted at today; Cannon Street falls within the Ward of Candlewick, one of 25 ancient subdivisions of the City of London. 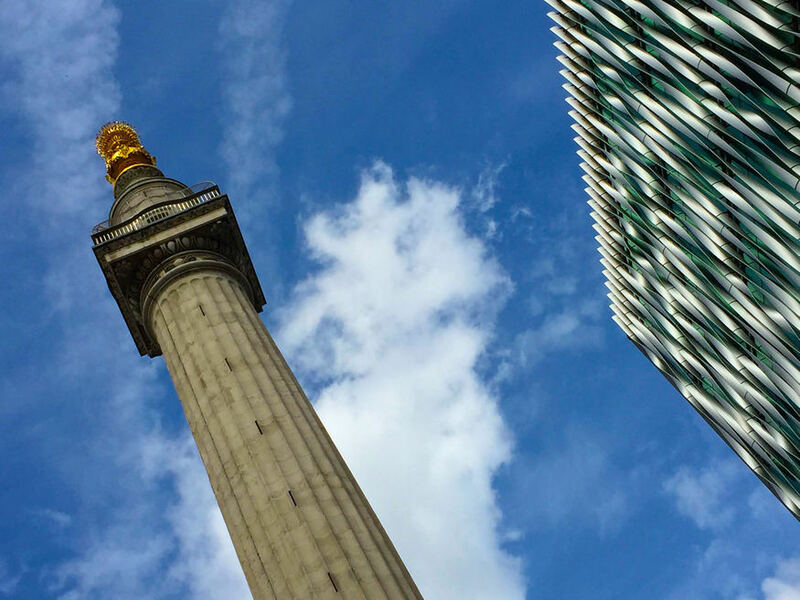 Named after the Monument to the Great Fire of London, a huge column designed by Christopher Wren and Robert Hooke, which stands above the station. One of London's traditional sites of execution, Tower Hill has a very simple etymology. It is a hill beside the Tower of London. The most easterly of two stations to carry the word Aldgate, both of which are named after an ancient gateway into the City. But how did Aldgate get its name? The short answer is 'nobody knows'. The long answer is 'Perhaps it's simply the old gate into the city, or maybe it's from Ale Gate because it had a tavern attached to it. Then again, it could be named after an Anglo-Saxon called Ealh, or maybe it's a corruption of East Gate. Could it derive from Aelgate, which would have meant a gate that is open to all?'. Feel free to make your own speculation in the comments. Unlike its neighbour at Aldgate, the nominative origins of Whitechapel are undisputed and recorded. The church of St Mary Matfelon, whose remains can be found in Altab Ali Park, was initially built of white chalk rubble. The distinctive shine led to its nickname of the 'white chapel' which was applied to the local area as early as the 13th century. The East End name is first recorded around 1000 CE, as Stybbanhythe. It's thought to come from the personal name of an Anglo-Saxon (Stebben), who had a landing place (hythe) on the river. In addition, the only Womble to appear on the tube map. Known thus since the 13th century, Mile End is a mile from Aldgate pump, one of the traditional locations for measuring distance. The road and tube station are named after a bow-shaped (that is to say, arched) bridge that once spanned the River Lea hereabouts. For Bow, see above. 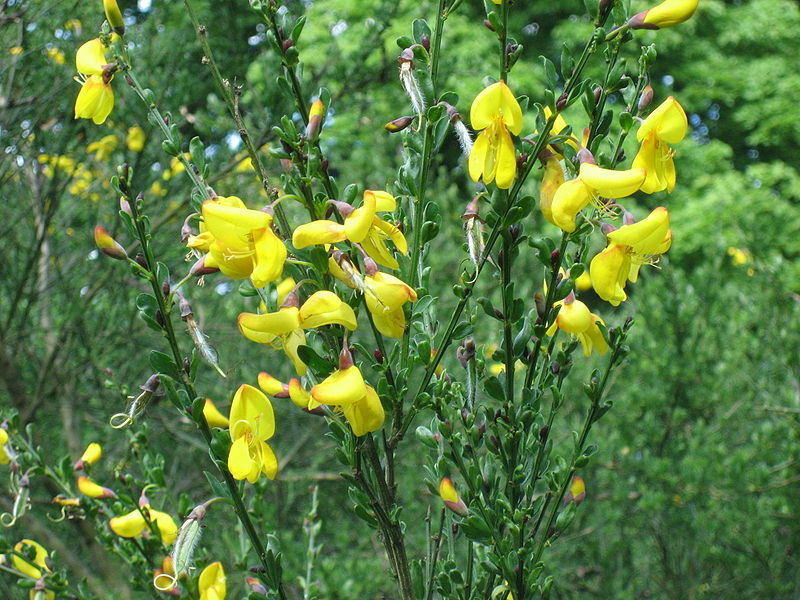 The Bromley bit once again derives from the plant called broom, which we last encountered in West Brompton. It must have grown sufficiently thick in these parts to constitute a large wood (leah). Broom-leah eventually became Bromley. 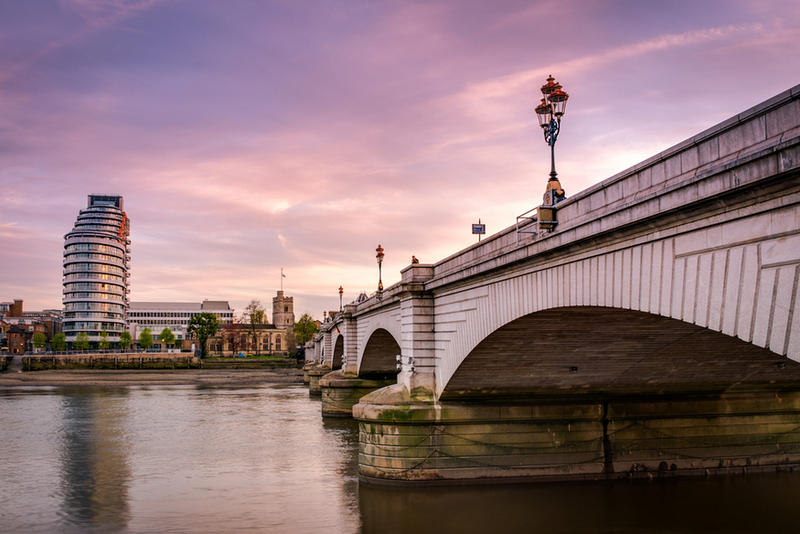 The 'by-Bow' helps us distinguish it from the London town and borough of Bromley, which has a different etymology. In the beginning, there was Hamme. This common place name, meaning a dry area of land between rivers (here, the Lea, Thames and Roding), was first recorded in these parts a century before the Normans came over. In the 12th century, the land was partitioned into East Ham and West Ham. One of the more unusual London place names, it's pronounced as Plahr-stow, not Play-stow. The name recalls Sir Hugh De Plaitz, who married into the land-owning Mountfitchet family. A 'stow' was a meeting place within a manor. 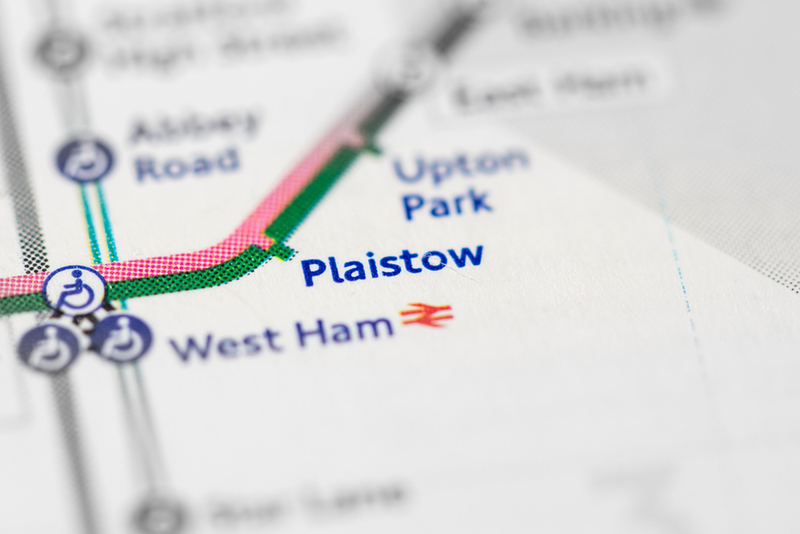 Some have alternatively suggested a connection to miracle plays — so Plai-stow was a 'play meetup spot'. The name of this district, later adopted by West Ham FC for its (now former) ground, goes back only to the 1880s. It was used as a marketing term for new housing built near the hamlet of Upton. That name simply means a farm or homestead on higher ground. See West Ham and apply a more easterly mien. Barking is an Anglo-Saxon phrase, first recorded as Berecingas. It derives from a local chieftain called Bereca or means 'the settlement by the birch trees'. We prefer the latter, if only so we can talk about catching the train from the oak town (Acton) to the place of the birch trees, via the broom tree clearing (Bromley). Sources are divided on the origin of Upney. It may mean 'higher stream', a reference to the Mayes Brook. Alternatively, it could refer to a 'higher island' as the brook does bifurcate around the area. After the first world war, Becontree went from an obscure village to the world's largest public housing estate. This is another location named after a plant, easily spotted in the -tree part of the name. The 'Becon' bit might refer to a beacon, but more likely derives from the people of Beohha who had an encampment in the area during Anglo-Saxon times — no doubt beside a distinctive tree. This is another of those early Anglo-Saxon places, first recorded in 666 as Dæccanhaam. It almost certainly derives from a personal name like Daecca, while the -ham means farmstead. The Heathway refers to the road that leads to Becontree Heath. More arboreal references — the District line really does live up to its green colour. Little of noise and toil troubled this once rural area until the 1930s, when Elm Park 'garden city' replaced the sparrows and bales. The name was chosen in 1933, taken from one of the displaced farms. Image by Dave Taskis under creative commons licence. As we approach the end of the line, we find one of the more puzzling etymologies. Hornchurch may get its name, quite literally, from a horned church. First mentioned in 1222, the parish church may have displayed horn-like gables, or else been decorated with animal horns. Nobody is really sure. 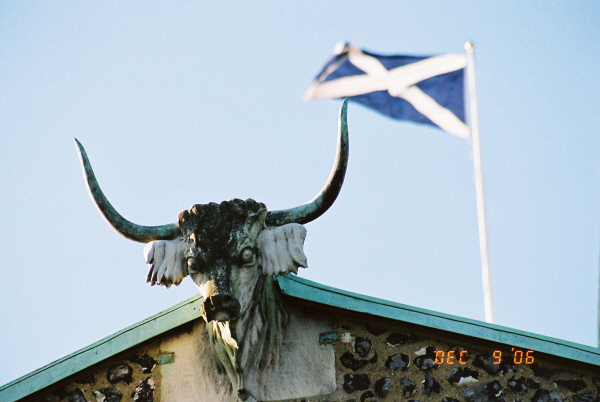 St Andrew's Church maintains the nebulous tradition with a horned bull's head of later origin (pictured). You could almost guess this one. 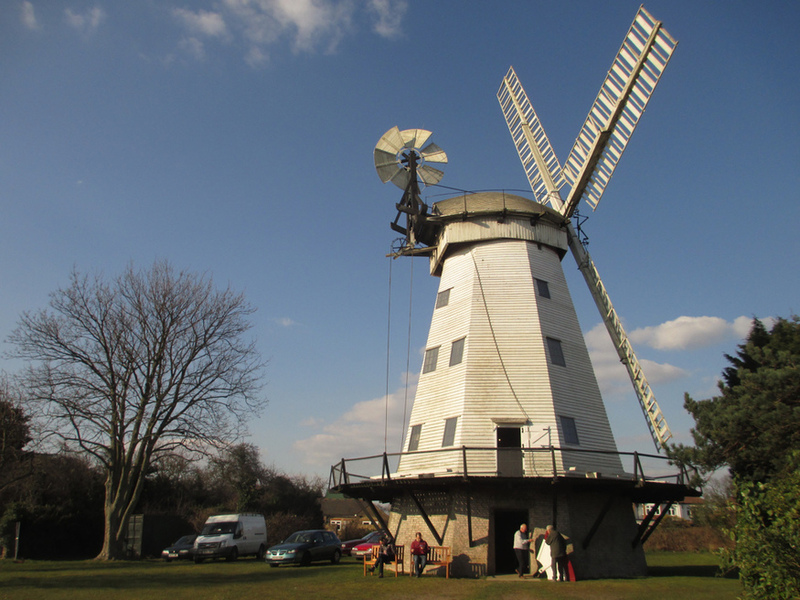 As with Upney, the 'Up-' of Upminster refers to higher ground. The minster part references a church. The bridge of Upminster Bridge is the one that straddles the River Ingrebourne. See also Bakerloo, Central, Hammersmith & City, Jubilee, Metropolitan, Northern, Piccadilly, Victoria.